Charlie Chaplin wore one. Winston Churchill wore one. Even David Beckham recently tied one on. But finessing a bow tie is likely one of the most maddening feats of manual dexterity you'll ever attempt. (How did our grandfathers do it?) We suggest avoiding the frustration altogether by strapping on a wooden version from Two Guys, an Oklahoma-based company that reclaims exotic hardwoods from flooring and furniture to create its handcrafted wares. 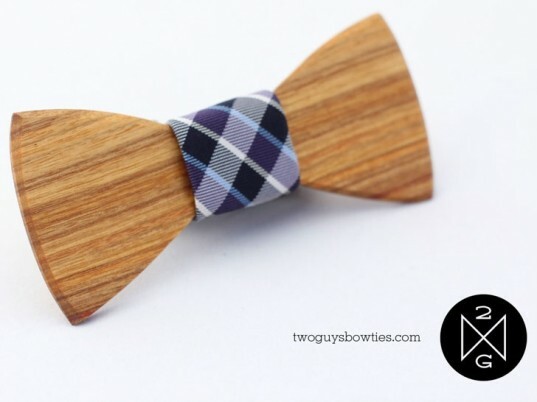 Available in myriad wood grains or engraved patterns (including polka dots and plaid), each bow tie is a unique fusion of carpentry and fashion. The ties come in basic, premium, and limited editions, depending on the wood used and the complexity of the design. The ties, which begin at $45, come in basic, premium, and limited editions, depending on the wood used and the complexity of the design. Centered on every tie, in lieu of a knot, is a swatch of contrasting fabric, one that might even have been part of a vintage necktie in a previous life. Two Guys also creates custom ties for weddings and other special occasions. Something else to look forward to? Wooden cuff links, which are due to launch in the first half of the year. 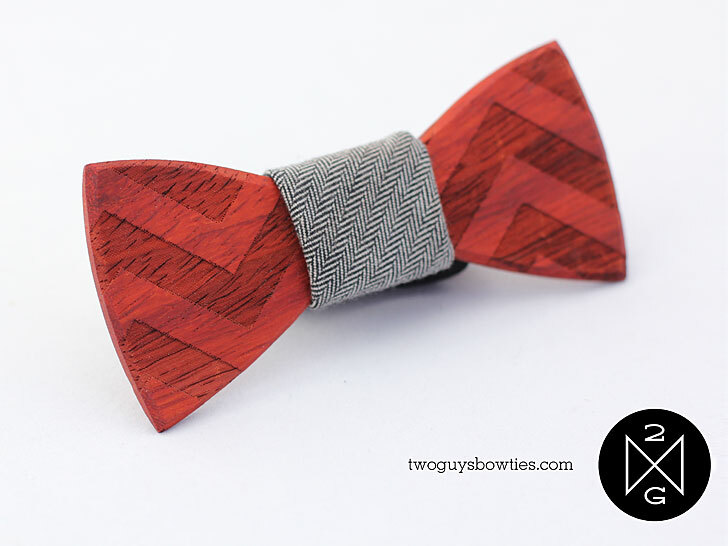 Two Guys began when, well, two guys named Adam Teague and Tim Paslay came up short in their quest for the perfect bow tie. Turning to wood was a "natural adaptation" for them, Teague and Paslay tell Ecouterre. "We both have built things out of wood for years and it seemed like the perfect opportunity to use some sophisticated tools and techniques to create something we would love to wear." The ties, which begin at $45, come in basic, premium, and limited editions, depending on the wood used and the complexity of the design. Centered on every tie, in lieu of a knot, is a swatch of contrasting fabric, one that might even have been part of a vintage necktie in a previous life. Two Guys also creates custom ties for weddings and other special occasions.